Life Before the Dinosaurs: Palaeospondylus. 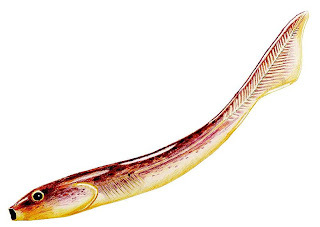 Palaeospondylus was a mysterious worm-like fish which has been described as a larval tetrapod, lungfish, unarmored placoderm, and agnathan. Palaeospondylus was discovered in Scotland and is 2" long. This image shows Coccosteus attacking four Palaeospondylus. 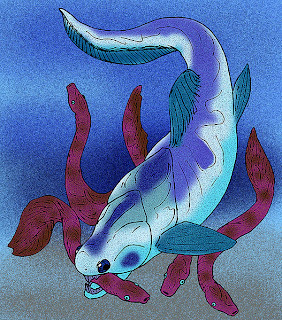 Palaeospondylus may have been a parasite or an early lungfish. Palaeospondylus had a weird basket-like formation in the skull, but the use for this basket-like formation is unknown. Thanks for the mail, Art! I never heard of Sclerodus pustuliferus! And I would really like to see your tattoos!